"Don't forget who brung you to the dance," is a variation of the old adage that admonishes you to remember who/what it was that provided the opportunity to be where you are now. It aptly applies to radio communications of all sorts. 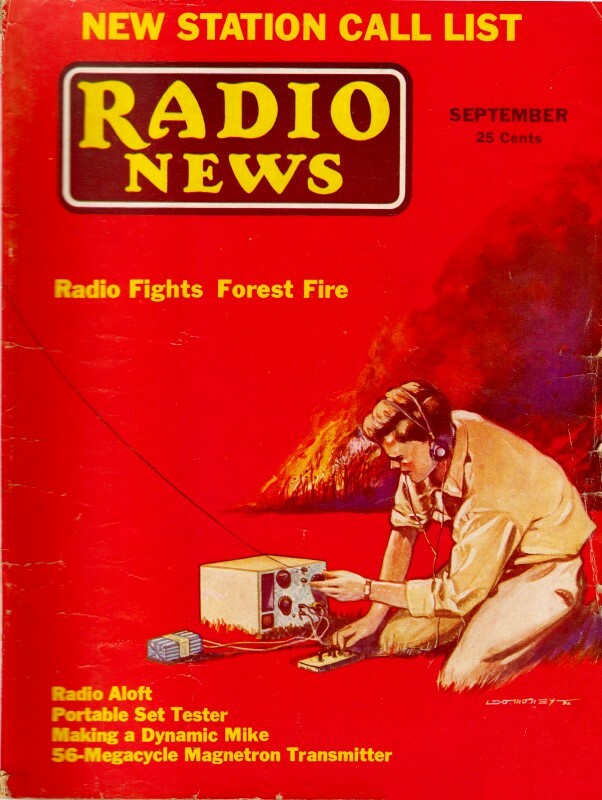 This short article from a 1932 edition of Radio News discusses the advent of radio beacon installations across America to facilitate air navigation during inclement weather. 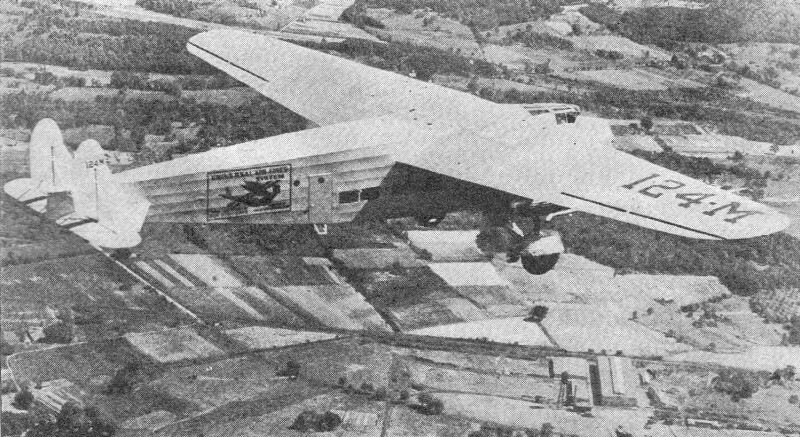 Before there was a Federal Aviation Administration (FAA), the Department of Commerce handled commercial air traffic for passenger and cargo payloads. Aviation was on the verge of becoming a very profitable industry (the Douglas DC-3 would make that happen in 1935) and it was necessary to develop airspace controls to ensure safety and smooth operations. Early direction finding equipment used a directional loop antenna to indicate the bearing (not necessarily the heading, due to winds) to a ground-based broadcast station. Audible signals indicated whether the aircraft location was to the left or right of the station. Visual indicators would later provide course deviation information. Aside from GPS, radio beacon navigation is fundamentally the same today as it was in 1932, only with more precision, greater reliability, and more reference stations. If you don't know a VORTAC station when you see it, take a look to the left - yep, that's what those things you see sitting in fields all over America are! By John B. Brennan, Jr.
Modern airport and 'plane radio equipment not only provides an operations communication medium, but also a guide for blind flying and landing under weather conditions which would otherwise offer an insurmountable hazard to 'planes, pilots and passengers. Picture yourself on a plane, one of those big tri-motored affairs, which has just taken off from the Newark Airport, bound for Cleveland. Although you may not have known it, the pilot, previous to the take-off, scanned the weather dispatches at the Operations Office and found that he would have good weather along the major portion of his course but on arriving in the vicinity of Cleveland he might expect haze and fog. Once up in the air his co-pilot, who is also the radio operator, has donned the headphones, switched on the radio receiver and has tuned it in to the signals being transmitted by the radio range beacons, of which, on his course, there are three; one at New Brunswick, New Jersey, one at Bellefonte, Pennsylvania, and the other at Cleveland, Ohio, all on direct route. In clear weather it is not necessary to depend on the radio range beacons for an indication of the true course since visual searchlight beacons and markers on the ground at these searchlight points are situated along the course every ten miles. 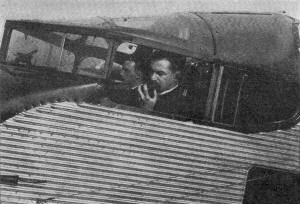 Therefore, having satisfied himself that the radio receiver is functioning properly the co-pilot tunes it to another wavelength so that he may listen to the many radio ground stations located along the path of his course and to the major aeronautical ground stations located at the scheduled stopping points along his route and which are a part of the vast radio chain system operated by the airways organization which employs him. Thus, speeding along at some ninety to one hundred and ten miles an hour, the plane in which you are comfortably seated is always in constant communication with some radio station on the ground and your pilots are being advised periodically of flying conditions ahead of them, i.e., visibility, height of ceiling, force and direction of the wind and so forth. The relief pilot functions as radio operator, receiving weather reports, beacon signals and landing instructions. By means of his transmitter he keeps ground stations informed of the 'plane's position and carries on communications incidental to operations. Then, too, the co-pilot keeps the ground stations posted on the progress of the flight of your plane and every fifteen minutes he switches on his radio transmitter and reports his position along the course. As you near Cleveland the threatened foggy weather has materialized and you fly into a blanket of fog so thick that it is difficult to see the tips of the monstrous wings of the plane. Spotting a position on the ground is out of the question under these conditions and it is here that the radio range beacons come into play. Tuning to the beacon wavelength the operator listens for the characteristic signal, a long dash, which will tell him that he is on his correct course. If the plane is bearing to one side of the beacon path of signals then he will hear a dot and a dash while if on the other side he hears a dash and a dot. This when the dot dash and the dash dot converge into one long dash that the pilot knows that' he is bearing along the true course. Intermediate marker radio beacons advise him that he is nearing Cleveland and through a hole in the misty blanket he comes down to pick out familiar landmarks on the ground. By this time the visual beacons are sending out their friendly flashes of piercing light and after picking up the boundary lights at the Cleveland Airport he circles the field and comes in for a perfect three-point landing. Now lets change the scene and see what has been happening at the Cleveland ground station while the plane is approaching it through its blanket of fog. In the first place, before the plane reached the fog area the radio dispatcher at Cleveland Airport advised the pilot of the plane when he might expect to meet up with this impenetrable blanket. Because the pilot has been advising him of his position as he progressed along the route, the dispatcher knows exactly where the plane is. 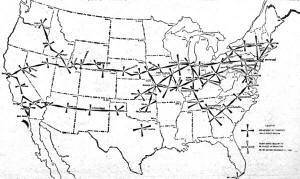 By means of little pins with the numbers of the various planes aloft the dispatcher marks off their position on a large map of the several air routes which converge at his airport. In addition to his job of keeping the planes advised of the weather they are flying into the dispatcher handles the routine messages concerning the taking off and arrival of planes at his and other airports. Thus you have been given a small picture of the radio drama being enacted daily at the hundreds of airports which dot the country and the countless planes which fly the air routes. Today the country is literally webbed with these air routes. 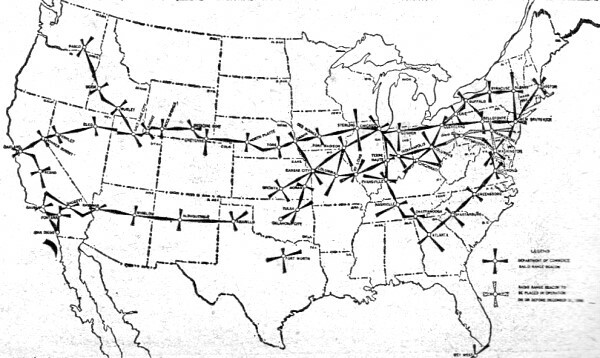 A glance at Figure 1 will show that there are two transcontinental routes, one extending by way of New York to Chicago; Omaha, Salt Lake City and thence westward across the Rockies to Oakland, California. Another, starting at New York takes a more southerly route after leaving Chicago and terminates at Los Angeles, going by way of Kansas City; Amarillo, Texas; Albuquerque, New Mexico, and Kingman, Arizona. On the West Coast a regularly established air route has terminals at Seattle and San Diego, with intermediate stops at such places as Portland, San Francisco and Los Angeles in either direction. On the East Coast one route goes to Buffalo by way of Albany, another goes to Boston by way of Hartford while still another goes to the Central and South American countries by way of Washington; Charleston, South Carolina; Jacksonville and Miami, Florida, and Havana, Cuba. On December first, 1930, there were forty radio range beacon stations in operation with an additional nine due to be completed and in operation by January first, 1931. These stations are of the aural type, sending out the characteristic dot dash, dash dot signal. They are shown in Figure 2. 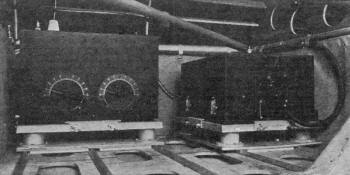 According to information made available by the U. S. Department of Commerce there were to be twenty-one radio range beacon stations of the visual type in operation by June of 1931, with forty-one others of this type projected for installation and operation in the then near future. Aeronautical radio apparatus may be divided roughly into two classes, i.e., the equipment used on the plane and the equipment used on the ground. In both cases these classes may be further subdivided into the transmitting and receiving equipment used at both terminals of the two-way communication system. 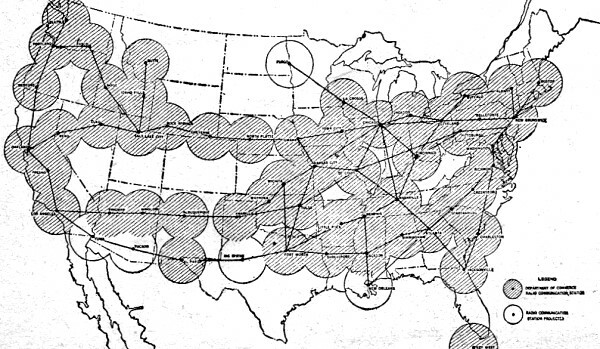 Figure 1 - The areas enclosed within circle s denote coverage by U.S. Department of Commerce transmitters which broadcast, at least hourly, weather reports, and other information for flyers. Unshaded areas denote stations either under construction or proposed. Figure 2 - Radio beacon transmitters are distributed at short intervals along the more important airways, as indicated on this map. For use in transport airplanes there has been developed a radio transmitter which is both light in weight and compact. Known as the Western Electric 10A radio transmitter, it has a carrier of fifty watts and is arranged for substantially complete voice modulation. It covers the range from 1,500 to 6.000 kilocycles. The operating frequency selected is maintained to within plus or minus .025% of the assigned value by means of a quality-crystal controlled oscillator. This accuracy is maintained even at extremes of flying weather by virtue of the fact that the quartz crystal is temperature controlled by a thermostat of the mercury-column, contact making type. Space in the transmitter is provided for two of these frequency controls. The crystal-controlled oscillator employs a tube of the five-watt variety which generates oscillations at a frequency which is one-half of that actually radiated by the antenna. Coupled to the output of the oscillator is a second five-watt tube which acts as a frequency doubler. This stage in turn is coupled to the modulating power amplifier which consists of a fifty-watt tube, Rice neutralized. The modulation system consists of three fifty-watt tubes connected in parallel whose grid circuits are energized by a special type of microphone transformer. Power for the transmitter may be supplied from either a dynamotor which is run from the ship's storage battery or from a special wind-driven generator. The twelve-volt ship's battery supplies filament excitation while the dynamotor or generator supplies 400 milliamperes at 1050 volts for plate and grid bias supply. Connection from the transmitter to the power supply is made by means of a specially designed plug provided with locking pins and a lock ring. The transmission of signals to aircraft is in the case of transport .service accomplished at the short wavelengths, say in the neighborhood of fifty meters, while for itinerant aircraft transmission from the ground to the plane takes place between 200 and 450 meters. Airport transmitters are assigned the frequency of 278 kc. while weather report stations usually transmit on frequencies lying in the range from 240 to 350 kc. Thus, to cover this wide range of wavelengths two separate Western Electric receivers have been developed. Essentially, both receivers look alike in outward and internal appearance excepting that one is designed for use at frequencies between 1500 to 6000 kc. while the other works between the frequencies of 230 to 500 kc. The short-wave receiver employs three stages of screen-grid radio-frequency amplification, a space-charge detector and one stage of audio-frequency amplification. The long-wave receiver employs one less r.f. stage and one more a.f. stage. They are designed to work with headphones ... not loud speakers. Power for these receivers is also obtained from a dynamotor as in the case of the transmitter, the plate potential being 200 volts and the filament voltage being obtained directly from the 12-volt storage battery. Both the transmitter and the two receivers are mounted on trays which are constructed in such a manner as to provide a high degree of shock absorption, thus guarding against unduly severe mechanical strain due to vibration and landing shocks. Usually both the transmitting and receiving equipment are located in some unused portion of the plane's fuselage and therefore a remote-control tuning apparatus is provided in the pilot's cockpit. For itinerant aircraft a low-powered transmitter (Figure 3) has been developed to meet the especial requirements of this branch of the flying service. This transmitter, in design is much like that intended for the use of the transport planes, the difference being that instead of having a fifty-watt carrier this one has only a ten-watt output. The transmitter consists of a quartz crystal oscillator, a modulating amplifier and one stage of audio-frequency amplification. The ten-watt output is substantially completely modulated and the tuning range of the transmitter is from 3000 kc. to 6500 kc. In the transmitter is contained an antenna transfer relay by means of which the antenna may be connected to either the transmitter or the receiver. Power for the operation of this transmitter is obtained from a dynamotor driven from the ship's 12-volt storage battery. It delivers 525 volts d.c.
As is to be expected, the ground station which is used to communicate with planes operating in the transport service over the established chain airways is more elaborate and more powerful than the plane equipment. The ground transmitter produces a carrier power of 400 watts which as in the case of the plane transmitter is substantially completely voice modulated. It is so designed that it may be adjusted for operation on any frequency between 1500 and 6000 kilocycles. This transmitter comprises the following units: a crystal-controlled oscillator, a frequency doubler, a modulating amplifier an audio-frequency amplifier and a power amplifier. In the oscillator and frequency-doubler stages five-watt tubes are employed, while in the modulating amplifier stage a fifty-watt tube is used. The radio-frequency power amplifier employs a single 1000-watt (1kw.) radiation cooled tube which operates at a plate potential of 2500 volts. The audio amplifier system is similar to the plane unit in that it uses three fifty-watt tubes connected in parallel and operated by a special design of microphone. The rectifier system works from a 220-volt three-phase 50 or 60 cycle line and supplies potentials on the order of 2500, 1000, 200, and 55 volts d.c. and 10 volts a.c. Rectification is obtained by means of seven low voltage mercury vapor rectifier tubes. At airports which are not on the regular chain airways and where there is the desire to provide radio communication facilities to itinerant aircraft the ground station is not nearly so elaborate. The Federal Radio Commission has stipulated that such ground stations operate on a frequency of 278 kc., and that their carrier output be restricted to 15 watts. Actually the transmitter described here is rated at ten watts output. It consists of a crystal-controlled oscillator, a modulating power amplifier, a speech power amplifier, a full-wave rectifier, filament supply and all the necessary control circuits. The purpose of such a transmitter is to provide communication to pilots on planes in the vicinity of or nearing the airport so equipped. It is not intended for long range communication. The maps which accompany this paper will serve to illustrate that fact that a pilot, whether he be of the itinerant or transport class and whose plane is equipped with the prescribed radio apparatus, need never be out of touch with the ground, regardless of whether he start out on a flight to a neighboring town or a more pretentious transcontinental flight. Every day flying becomes increasingly safer because radio provides the long arm of communication as no other agency can, to keep the pilot informed of flying conditions ahead, landing facilities at unfamiliar airports and the other thousand and one things which only pilots want to know when they are out of touch with the rest of civilization.